The Fellowes Powershred Shredmate Cross-Cut shredder is a compact personal shredder capable of shredding up to 4 sheets of 70gsm paper at a time. It shreds material into pieces measuring 4 x 23mm and has a P-4 DIN security rating. This makes it suitable for the shredding of highly confidential documents. Due to its compact size, this shredder has a small 115mm paper entry, so in order to shred an A4 sheet you will need to fold it in half first. 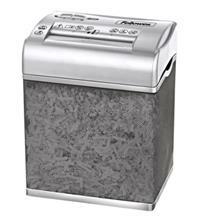 The unit will also shred staples and credit cards and has a 4.5 litre clear bin. Features include: a safety switch which disables the machine if the head is removed from the wastebasket; auto start and stop; and a reverse function to help clear any paper jams. The manufacturer Fellowes provide a warranty of 1 year for both the machine and cutters.